We have a new podcast episode for This Mobile Life! 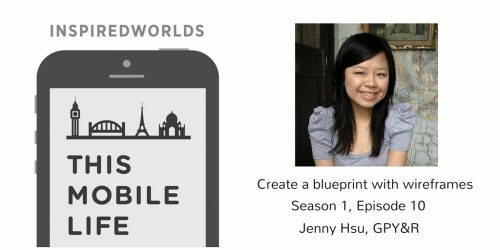 Season 1 Episode 10 (S1E10) is on “Create a blueprint with wireframes”. Its an in-depth chat on why we use wireframes and write requirements. We also discuss how we do it. I interview my good friend Jenny Hsu, business analyst from GPY&R. What’s the best advice you’ve gotten as a product manager? I was reading this thread on Quora on “What’s the best advice you’ve gotten as a product manager?”. I came across this epic answer which I can relate to. I’ve embedded the advice in full. Its from Varun Singh, PM @ Facebook. He offers 3 pieces of advice. I particularly like the first one which is about product backlog. A backlog is like a to-do list of user stories – things we may do in the future. The key takeaway from me is that the backlog is based on historical information. It can often be a blackhole where things go in. We dig around there looking for what to build for the next few months. It also takes a lot of mental capacity to look at it and to see the list continue to grow over time. You can waste a lot of time ordering and sorting your product backlog. Whilst it is important to update it regularly to groom your backlog, you must recognise that the product backlog was created at a specific point in time when we had information that was considered current. With new insights & customer feedback, a product manager needs to have the ability to react quickly and be flexible. I also like his two other pieces of advice which I’ve had to deal with on a regular basis. Deciding what not to build and understanding the wrong reasons to build is critical. I have been thinking about products lately. I was inspired to do a short 1 minute video on my thought of the week on “retention”. Its a prelude to my upcoming podcast. I was inspired by this podcast by SAAS Revolution with Brian Balfour, VP of Growth at Hubspot. He spoke about one of the key metrics for growing a SaaS business is retention. He argues that retention is important because you can’t grow a product unless you have retention. This applies to any product. It so happens that its what I have been thinking about – retention.